So when I drove back out to Aspen a couple of weeks ago at the end of the festival to pick up Nick I ended up starting this one and just finished last night. Although it’s just about 300 pages, The Dinner felt shorter than that, and I’m sure if life wasn’t so busy at the moment I could have devoured this (har har) in just a couple of days instead of 10. 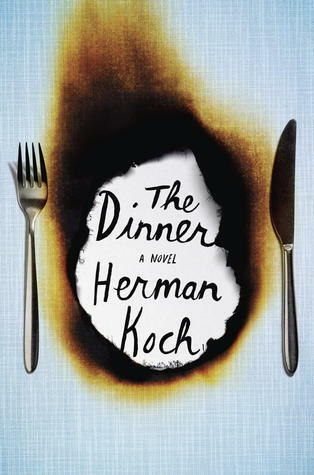 I’m seeing The Dinner compared to Gillian Flynn’s Gone Girl, and while I agree they are in the same family (har har, okay that’s it!) with it’s dark, sardonic vibe and twisty secret-revealing journey, Gone Girl felt much faster paced and sinister to me. That’s not to say I didn’t really enjoy The Dinner. It starts out normal enough—our narrator Paul doesn’t like his famous brother, whom he’s meeting for dinner this night with their wives. But as the reasons for the dislike unfold, told mostly as memories/flashbacks non-chronologically, the story just gets darker and more twisted with every “course.” I loved the setting of a snooty pretentious restaurant and that it takes place over one evening. Paul would omit certain details of events throughout the book, like making a point to let the reader know he was not mentioning the name of the restaurant on purpose and why, and that simple move by the author also made my imagination run wild. Is this dinner actually all taking place way, way far back in the past? Is Paul telling us this from prison? What for? and so on. This is one book that I could totally picture as an indie film. The characters mostly seem realistic, and their actions make you think about choices, family, parenting, love for your children and what you would do to for them, from preserving their innocence to defending them to keeping them safe from harm. I wish I could have read this as part of a group! It would have been excellent for a group discussion. Read from August 18 to 27, 2013. This entry was posted in books and tagged drama, family, fiction, literature, male adolescence, thriller by kristin @ my little heart melodies. Bookmark the permalink. Har har! LOL 😉 I’ve seen such crazy mixed reviews on this one that I don’t know what to do! I’ll have to check it out at some point! Ooh yeah, a play would be great. Didn’t think of that! I think I said indie film because of all the flashbacks. But a play would be fantastic.